Bud Scheffel has a passion for art; a gift for creating high-end sculpture in metal and glass; and has had the rare ability to both anticipate new markets and to know how to create products that sell well to discriminating, high-end buyers. He started his career in 1982, at age 22, traveling internationally as a graphic designer and art director and worked all over the U.S., Europe and Asia, including in Milan, Paris, Tokyo, Los Angeles, and New York. Upon his return in 1987, he started his own ad agency in New York City, which he later moved to the Catskill Mountains near Woodstock, New York. He met his future wife and partner, Ursula Perry, who was principal in her own business – a rep firm devoted to the American Craft and International Gift industries. Together they pooled their resources to launch Earth Saver Wind Sculpture, which became known as one of the most progressive, inspiring metal craft lines of home and garden sculpture in the gift industry. “When we started, there were very few companies doing metal sculpture, but I did a lot of research and saw that there was a need for the many mail order catalogs to have beautiful art pieces to feature on the cover. 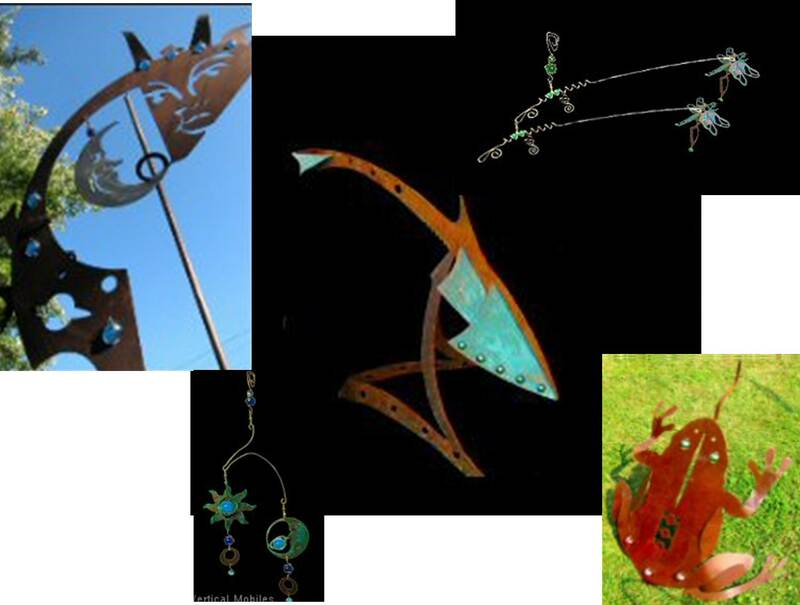 I’d called on Plough & Hearth Magazine when I was selling advertising, and my wife was already selling her company’s wind chimes to them, so I reached out to their gift buyer first and began working with them and other mail order catalogs to sell my original metal sculptures for home and garden. For Scheffel, the unwelcome push out of the wholesale market meant rethinking his entire business model. It also got him thinking differently about himself as an artist and about what type of art he wanted to do. “The economics outside wholesale were very different. I moved from selling seventy-four to a hundred and forty-four units at a time to companies to selling one-by-one at retail. Fortunately, my kids were grown and our expenses were less, so I could sell direct to consumers and make it work. I also discovered the upside for me, which was that working as an artist again gave me the chance to focus on the creative side of the work rather than on the administrative and business ends, which were what I’d had to do to support a large production model. But very few working artists have that luxury. And now, the retail craft business is changing again, this time because of the Internet. “What you see when you go to most craft shows is the majority of vendors selling items that cost $100 or less. What that means is that you have to make a lot of product quickly, and you need to sell a lot to even make back the cost of your booth, which can cost thousands of dollars for the more exclusive shows. “I’ve concentrated my efforts on the high-end, juried shows. There are about twenty that I go to, and you will find work there being sold in the $500/$1000/$5000+ range, but it takes a lot to get accepted at that level, and you have to be prepared to pay your dues first. “I think the best shows are the American Craft Council Show in Baltimore, One of a Kind in Chicago, the Smithsonian Craft Show in D.C., and for outdoor garden – the Philadelphia Flower Show, which is great because it’s an eight or nine day show with 300,000 attendees. It’s one of the biggest in the garden world. Bud Scheffel, www.earthsaverwindsculpture.com, is rethinking his current business model and moving more toward large sculpture and corporate work, since he’s seeing fewer quality retail craft shows and the market is undergoing more change. “I see a lot fewer new vendors at the craft shows these days, and many who are there have been in the industry a long time and seem to me to be less willing to change and try new ideas. However, I do believe quality will endure and that those who make good products can make headway if they do their research and learn the business as well as the art side. “I’d particularly recommend learning how to market and price your work, getting good quality studio photos done to showcase your pieces properly, and researching to find out which shows are best for you to attend. Zapplication is the best reference site for that, and you can also check Sunshine Artist Magazine, which does a report of show rankings. Arts to Market celebrates the work of artists, innovators and arts organizations and shares advice on balancing the creative life with arts marketing and business development. As an undergraduate student, Marlene True thought she would pursue ceramics, her first love in art. But when she took an elective in metal work, she found she loved the range of materials and techniques that involved. 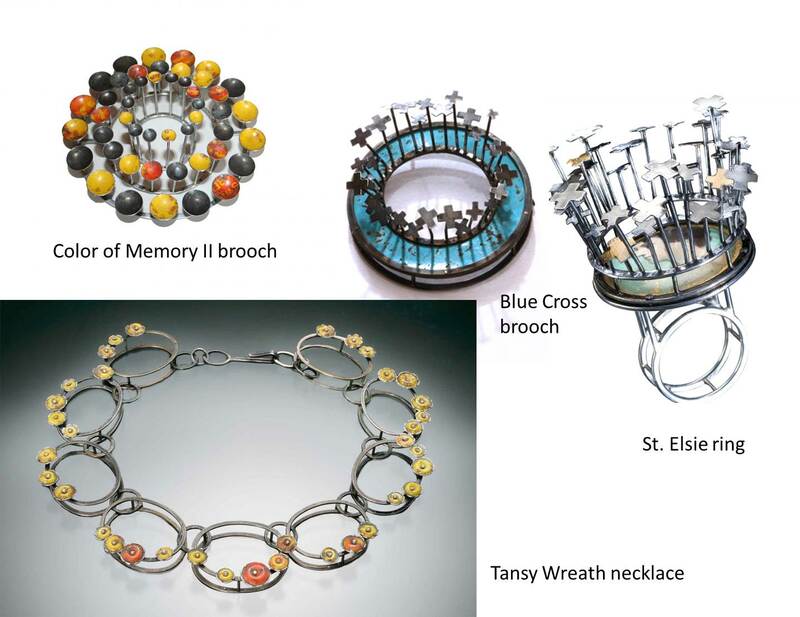 She did find it challenging to find ways to bring color to the metal work, but that changed when she heard a lecture by Bobby Hansson, author of The Fine Art of the Tin Can, which provided a whole new medium that she found she loved and is still using today in her art along with other metals. Tin cans, which are actually made from mild steel with a thin tin coating, proved to be colorful, lightweight, yet structurally strong, so allowed for working in larger pieces. True knew that in the process of fabricating, soldering would remove painted images, but discovered she could use gold plating and powder coating to get the surface color she wanted. Fabrication methods such as Cold-connecting gave her the ability to build pieces while retaining the original color or image. True started working with tin ten years ago and, by 2008, she felt really established with it. She sold at craft shows and found she loved talking with people and engaging – and saw that consumers often wanted to share what they knew about the history of some of her found tin items – whether they were food cans, cosmetic tins, or other types of old containers. She also enjoyed doing research and finding out more about the product’s background and how it had changed – both in its graphic design and usage over the years. When at one point her work turned to using bottle caps to make tiny spoons and other items, she discovered people had some very particular brand loyalty to favorite types of soda and beer! While selling at craft shows she found that she needed to make a lot of production items to have enough inventory to sell, and through that process learned she preferred working at her bench making one of a kind pieces which kept the work moving in new directions. Metal Museum Store, Memphis, TN; Facèré Gallery, Seattle, WA; and Equinox Gallery, San Antonio, TX. She’ll be teaching at Thomas Mann Studio Flux in New Orleans from October 30 – November 5 and then in scheduled to teach at West Dean College in Chichester, West Sussex, UK from May 2 – 5. Customer-centric marketing: How close is too close?